As of today, some 53.6 per cent of Syria’s chemical weapons material has been removed from or destroyed in the conflict-ridden country. The deadline for completing the destruction of Syria’s entire chemical weapons programme is 30 June 2014. 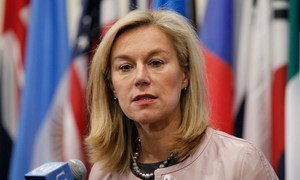 “This represents important progress,” said OPCW-UN Joint Mission Special Coordinator Sigrid Kaag, as she made the announcement. A total of 11 consignments of chemicals have now been transported out of Syria for destruction, according to a news release issued by the OPCW. When all of the Syrian chemicals from all storage sites have been loaded aboard Danish and Norwegian cargo ships, they will be transported to various locations for destruction under the verification of OPCW inspectors. OPCW added that as the removal process continues, a team of experts is currently in Syria to facilitate the formulation of a plan to destroy certain structures that housed Syria’s chemical weapons production facilities.